Plant Magic Magne Cal Plus is an excellent product to accompany any of the premium PK boosters on the market today also a remedy for plants suffering with calcium or magnesium deficiencies. Plant Magic Magne Cal Plus works alongside the PK to aid with the uptake of these vital elements as well as giving the plant a surge of trace elements. As the demand for Phosphorus and Potassium increases so does the demand for Magnesium and Calcium. It is vital to have the correct ratio which Magne Cal plus has. 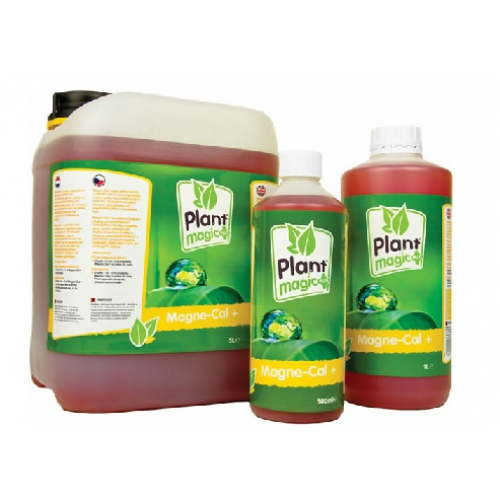 Magne Cal plus will also stop Magnesium and Calcium deficiencies as well as giving the plant a food source to green up the leaves. there is just the one bottle for both the vegatative stage as well as the flowering stage.